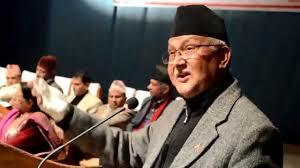 Nepal’s new prime minister Khadga Prasad Oli, who took charge on Monday, said he was looking forward to visiting India soon. President Ram Baran Yadav administered the oaths of office and secrecy to Communist Party of Nepal (United Marxist Leninist) chairman Oli and his cabinet colleagues at a brief function in Sheetal Niwas, the presidential palace, here. Oli, who was elected prime minister by the country's parliament on Sunday, named two deputy premiers in Bijaya Kumar Gachhadar and Kamal Thapa. The two have been rewarded for the support they extended to Oli during Sunday's vote against immediate past premier Sushil Koirala, of the Nepali Congress. The 63-year-old chairman of the Communist Party of Nepal-Unified Marxist Leninist was administered oath of office by President Ram Baran Yadav at a function held in Shital Niwas, the President’s official residence. A team of seven ministers, including those from the Unified Communist Party of Nepal-Maoist, Rashtriya Prajatantra Party (Nepal) and Madhesi Peoples’ Rights Forum-Democratic, were administered oath during the ceremony. They included deputy prime ministers Bijay Gachchadar, chairman of the MPRF-D, and Kamal Thapa, chief of the right-wing RPP-N.